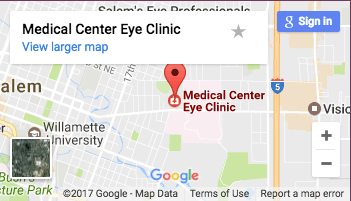 According to the American Medical Association, there are over 20,000 ophthalmologists in Salem and around the United States. An ophthalmologist is a physician that performs eye exams and surgeries. The difference between an ophthalmologist and an optometrist is that an ophthalmologist has additional years of study and experience treating the various conditions of the eye and can perform surgeries, where optometrists usually focus on routine eye health and basic vision needs, such as glasses or contact lenses. When planning an appointment with your Salem ophthalmologist, it helps to know what to expect. There can be a lot going on and it can get confusing or overwhelming, so we’re going to walk you through everything you might encounter during your exam. Each of our physicians has two assistants with them during the typical work day: a runner, and a writer, or scribe. The runner takes each patient to an exam room for their initial workup. The runner’s work includes reviewing a patient’s medical history, medications, and any complaints that the patient may have experienced. They also check the patient’s visual acuity and peripheral vision during each exam. Depending on the patient’s needs, the runner will also check their depth perception, color vision, or perform a dry eye test. This gets the patient ready for the doctor’s exam and helps the office flow efficiently. When the doctor enters the room, the scribe follows to document the doctor’s findings during the exam. The doctor begins the exam by making sure any questions the patient may have are addressed. The exam will usually start with a refraction, which new prescriptions for glasses are determined. The doctor will also check each patient’s pupils and eye muscle movement for any abnormalities. Usually the doctor will leave the room at this point to move on to his next patient. The scribe will stay behind and check the patient’s intraocular pressure and put in dilating drops. The dilating drops open up the pupils and allow the doctor to see to the back of the eyes. It takes about 20 minutes to get the full effect, and can last for a few hours. The effects of dilation include trouble focusing up close and some light sensitivity. Once the pupils are fully dilated, the doctor uses the slit lamp microscope and different magnifying lenses to look at the eyes from front to back. During this examination is where the doctor would detect any conditions that may or may not need treatment. Some common ocular conditions are cataracts, diabetic retinopathy, macular degeneration, and glaucoma. Most of these diagnoses are initially made based on what the doctor sees during the exam. However, there are many tests we can perform to verify any findings that allow the doctor to further evaluate and manage each patient’s individual needs. By the age of 80, more than half of Americans will have been diagnosed with cataracts or undergone surgery to have them removed. Cataract surgery is one of the most common surgeries in the United States. It is very simple and requires virtually no recovery for most patients. During the surgery, the doctor will remove the natural lens inside the eye that is affected by the cataract, and replace it with a mad-made lens. In order to have cataracts removed, patients must meet certain criteria for insurance coverage. If a patient qualifies and is interested in scheduling cataract surgery, they schedule an appointment with our surgery coordinator. The patient will be scheduled for a pre-op appointment to obtain measurements and go over instructions for their surgery. These measurements include ultrasound or manual keratometry, corneal topography, and A-Scan. These measurements together help the doctor make accurate decisions regarding the lens he will use to replace the natural lens in the eye affected by the cataract. An ophthalmologist will also do various testing to screen for glaucoma, which is a disease that usually involves increased intraocular pressure (pressure from the fluid in the eye), and can cause damage to the optic nerve and vision loss. Eye pressure is measured with a tonometer, a probe-like device that measures eye. In patients with glaucoma, it also helps to obtain visual field measurements, OCT images, pachymetry, and gonioscopy. There are two basic types of visual field machine: Humphrey and Goldmann. The Humphrey is an automatic test of the patient’s functional vision. It can detect changes in the vision that a patient may not have even noticed. This test is most commonly used for glaucoma evaluation but can also be used for diseases such as optic neuritis, and with high risk medication monitoring. The Goldmann visual field measures the same information as the Humphrey, but is performed by a technician placing the flashing lights in specific areas to complete the map of functional vision. The technician then draws the vision map by hand. This test is most commonly used for droopy eyelid evaluation, but can be helpful with patients who cannot tolerate the Humphrey visual field, as it is much simpler to perform. It is also the visual field test requested by the state in evaluating visual disabilities. OCT images are used to help diagnose diseases of the back of the eye: the retina, macula, and optic nerve. These images can show changes caused by macular degeneration, glaucoma, diabetic retinopathy, and many other conditions. The machine acts like a camera but can give us scans through the different layers of the retina to show things that may not be fully visible on an exam by the doctor. These images are typically taken once a year in patients already diagnosed with one of the above mentioned diseases. Pachymetry measures the thickness of the cornea, which can affect intraocular pressure. This test is performed by numbing the eye with drops, then gently touching the front of the eye with a probe. We get about ten measurements on each eye, then calculate the average for each. Pachymetry can also be used to help diagnose a number of corneal diseases. For most patients, this test is only needed once in a lifetime, but those with diseases that cause corneal changes might need it performed more frequently. Sometimes the doctors will want to perform gonioscopy to clearly evaluate the angles at the front of the eye to determine if the drainage system is working correctly, which can also affect intraocular pressure. This test is performed by the doctor at the slit lamp microscope with a special mirrored lens that is held to the front of the eye. Gonioscopy is usually done once a year on patients with glaucoma, but can be done more frequently at the doctor’s discretion. With all the testing we have available, your ophthalmologists in Salem can catch most conditions early and treat accordingly. The tests are all easy on the patient and usually very quick. Due to the many conditions that can affect your eyes and vision in various ways, it is very important to have an Salem ophthalmologist that can help make sure your eyes are healthy now and into the future. I was thinking about having my dad’s cataract removed since I’m afraid it would grow and take up his whole eye someday. It’s nice to learn that having it treated will be simple and would almost need no recovery at all for most patients. That should help my dad realize that going blind is scarier than his surgery and take it. I’ll explain it to him later better with the new knowledge from your article. Thanks!